Hey everyone, I have some totally awesome news. 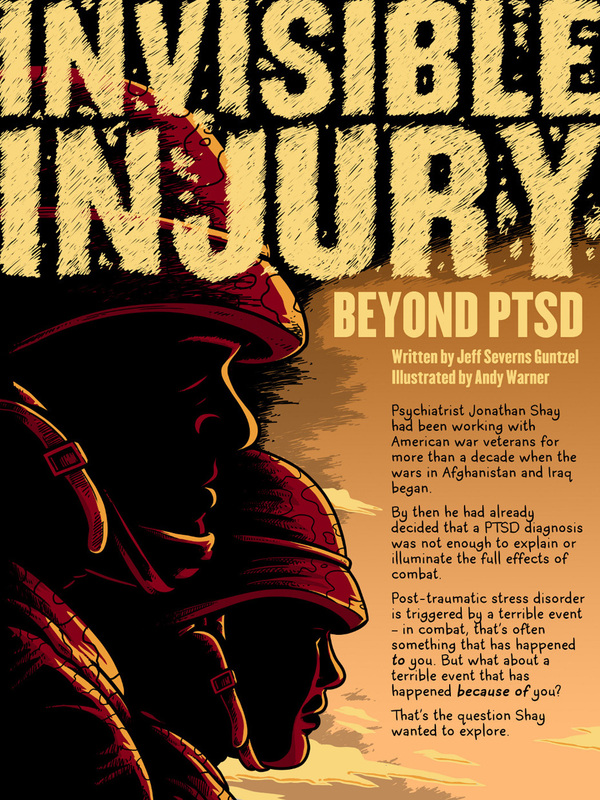 Symbolia has teamed up with American Public Media and the Public Insight Network to bring Invisible Injury: Beyond PTSD, a comic focusing on “moral injury” to life. It’s a stunning piece of comics journalism, and if you have any interest in war, the military, or psychological trauma you absolutely need to check it out. The reporting is top notch and the narrative is both clear and readable. It’s not always easy to work in talking heads, but Andy Warner straight up blew me away with his artwork. Not only is page layout phenomenal, but the entire tale is both dark and foreboding, but approachable and humanizing at the same time. Symbolia is incredibly proud to have collaborated on this project with so many incredible individuals and organizations to publish such a exceptional piece of comics work. Give it a read!